​​Only a handful remain. Wordcraft of Oregon website only. ​​"Kill your television before it kills you. A tale of addiction, invasion, and love...." Debut novel. "A psychedelic odyssey of love and spiritual discovery." "Four hundred billion stars for Brian Charles Clark's world-heavyweight champion novel... In this hallucinatory yet grounded tale, our narrator employs a richly allusive style, half Joyce, half William Burroughs." drugs, the aliens are replacing our fractured, amnesiac reality with a cohesive, linear history that corrodes the human capacity to think." ​"Brian Clark's first novel is a fever dream: a voluptuous explosion of melody and rhythm. A gender-bending ride in search of spiritual identity, Splitting revels in the regenerative power of art and language." 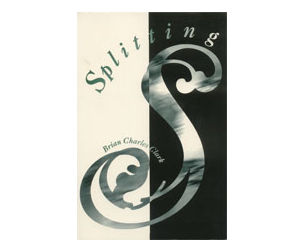 Brian Clark has been an independent literary publisher and editor, short order cook, glyphic designer, and hermetic ordealist. This is his first novel.